BR-Tuote also produces a line of muzzle mounted suppressors for weapons without any protruding barrel like the MP5, or very short barreled (11″ and 7″) AR15 variants. Mounts for the HK Tri-lock or factory muzzle threading are available. Made entirely of steel these suppressors are designed for rough use and full-auto fire like the rest of the BR line of Reflex Suppressors. The usual reflex suppressor muzzle thread and spigot detail is a metric thread (M14x1, M15x1, M17x1 or M18x1) with a long cylindrical “spigot” (F) and a relief cut (G) between the thread (H) and the shoulder (E) – see drawing. The purpose of the muzzle spigot (F) is to ensure precise alignment in conjunction with the close-fitting barrel bush at the rear of the suppressor. With this design the muzzle thread (H) is not used for alignment and the designer advises that the thread should not be a close fit. Click on Owner’s manual to see a drawing and detailed fitting instructions. The interchangeable bushing at the rear of the Reflex Suppressor is delrin or brass (high temperature applications). The bushing is reamed out on a lathe to the correct size to fit each individual barrel. The bushings are easily removable to allow a single suppressor to be used on several different rifles. Spare bushings are available. This mount allows the greatest flexibility for mounting solutions of any QD mount on the market. There is never any worry that the suppressed weapon will go down for maintenance, taking the suppressor with it. 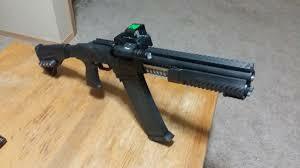 The suppressor can be issued to whomever needs it without the need to swap weapons and re-zero sights. Just drop it on and go! The QD mount consists of a steel collar designed to drop over the exposed portion of the barrel, behind the flash-hider. The suppressor is then slid over the muzzle and screwed onto the mounting collar. The collar is designed to interface with the bayonet lug allowing one handed mounting and removal of the suppressor. The entire process takes less time than it does to read about it. Mounting is simple and fast: Remove the mount and slip onto the flash-hider until the eccentric engages the rear ring. Slip the suppressor over the flash-hider and screw onto the mount until tight. Thats all there is to it! The suppressor expansion chamber has an inner tube that sleeves back over the barrel (combustion gases do not come in contact with the barrel). The standard inner-tube internal diameter is 22 mm. For barrels larger than 21 mm (0.827″) outside diameter, measured at the back of the suppressor, (usually 210 mm from the muzzle) a larger diameter inner tube – 25 mm or 29 mm can be provided. Suppressors reduce muzzle signature by lowering the pressure at which the gases are vented to the atmosphere. Suppressor baffles provide a large surface area to cool and trap the combustion gas, lowering its pressure. The more baffles, the better the sound reduction. However, with supersonic ammunition there is a point of diminishing returns where the muzzle blast noise is reduced below the bullet flight noise (which can not be suppressed). The Reflex Suppressor T8 model (T4 shown) with eight baffles is a good compromise between sound reduction, length and weight. The T8 models comply with British HSE Noise at Work Regulations on a typical 7.62×51 (308 Win) sniper rifle. The Ase Utra Z-Jet Suppressor (right) utilizes complex asymetric baffles for maximum noise reduction in a small package. This muzzle mount suppressor is exceptionally quiet on any weapon. Standard baffle apertures are 7.5 mm , 8,5 mm, 10,5 mm and 13.0 mm. As a rule, the bullet caliber (bullet actual diameter ) plus at least one millimetre gives the exit aperture diameter. The reinforced “magnum” model (stamped “M”) for cartridges above 30-06 case capacity has 10.5 mm exit aperture as standard (other aperture sizes to special order). The smaller the baffle hole diameter the better the sound suppression, but the difference between each of the above hole size increments is only 1 or 2 dB. In general, it is better to reduce the sound by adding more baffles than risk making the baffle holes too small. All rifle bullets yaw a little on leaving the muzzle. The longer the bullet the more baffle hole clearance needed to accommodate this yaw without risk of a bullet grazing a baffle. If a bullet grazes a baffle, it can cause a “flyer” or potentially the destruction of the suppressor if the bullet is caught by the baffle. The Reflex Suppressor is a practically maintenance free device. The suppressor should be cleaned after each shooting session. Remove the suppressor or leave the action of the rifle open after use. This helps avoid corrosion by letting condensation from powder gases evaporate away. A small amount of Break Free, Rig #2 or other light gun oil sprayed into the suppressor will prevent corrosion. WD40 can also be used but tactical operators are advised that WD40 will cause a large smoke signature when the suppressor is next used. Normal fouling from powder and primers do not have an effect on the suppressor’s functioning. Loose solid impurities like powder grains and carbon chips are easily removed by shaking the suppressor, while keeping it vertical, front end down. Washing with liquids or solvents is unadvisable.